Let's face it. To most people, legalese is bland. 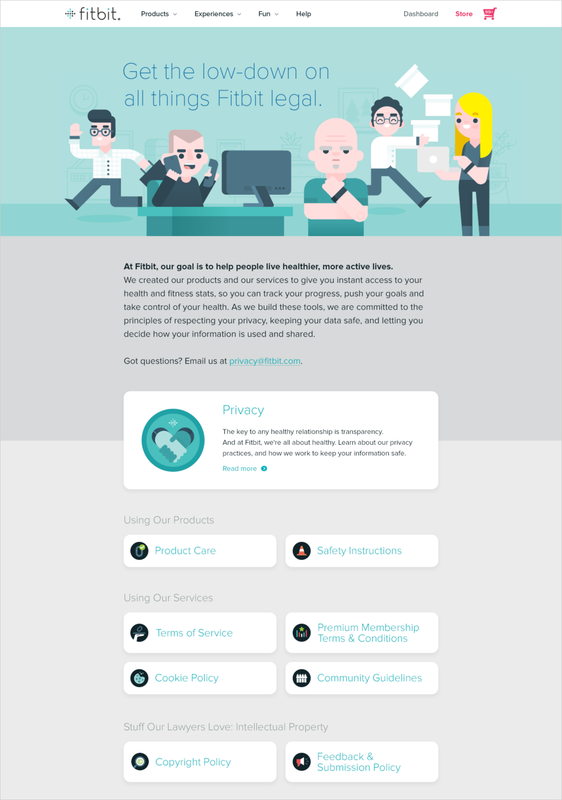 To stay true to Fitbit's mission, we redesigned the legal hub on Fitbit.com to feel as easy and simple as taking their first steps. We commissioned illustrations from Richard Perez throughout the pages, to bring in Fitbit's famous brand and create a familiar experience for the badge-seeking step warriors who use the Fitbit app. Fun fact: that's a factual depiction of the Fitbit legal team! It's a big deal to entrust a company with the details of your every day. When you wear a Fitbit tracker, you're sharing every triumph, every exercise streak, and every lazy day on the couch. So it's vital that every customer knows where Fitbit stands on privacy & data protection.